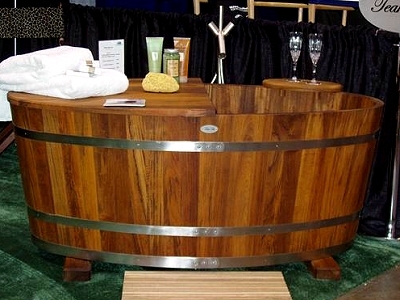 I love wooden bathtubs... In fact, tomorrow I'll have a whole big post about how much I like them and how I marvel at artisans that make them. Nice, right? Looks like it would go well in a spa or rustic space. 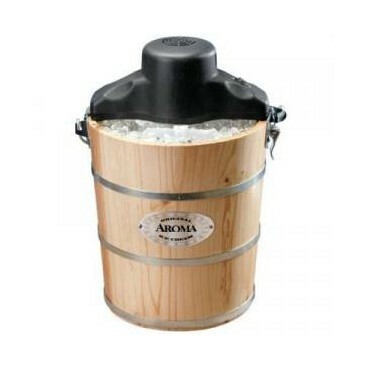 I have an Aroma Ice Cream maker, and while they are a fantastic machine, the design doesn't really evoke a major bath fixture for me. I can't get over how similar they are! Am I off my rocker here? I'm wondering if it would be rude of me to ask you to whip up a batch of ice cream when you visit. Raina- Not rude at all... you know I would! Sean- I see the barrel, too. No doubt I'll be making ice cream at Raina's house.